Major League Baseball on Friday unveiled its uniforms for the upcoming All-Star festivities in Washington D.C., and… well, lets just say you won’t forget what country you’re in. 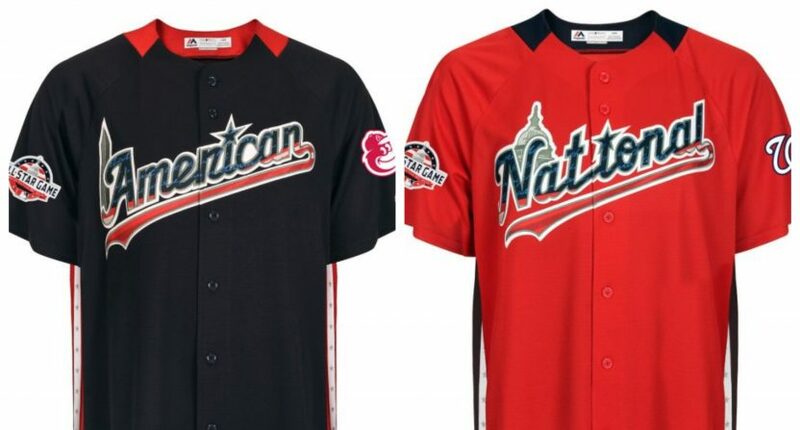 The jerseys, which players will wear during workouts and the Home Run Derby but not the All-Star Game itself, are all kinds of red, white and blue, with stars dotting each “I” and notable D.C. landmarks in the background — the Washington Monument for the AL and the U.S. Capitol for the NL. The socks, meanwhile, feature a variety of stars and stripes and red, white and blue patterns, plus an outline of the White House. As well as a more adventurous — and almost literally star-studded, even on the inside — version for workout day. How you feel about these jerseys likely depends on how you feel about the convergence of sports and patriotism. If you love flyovers and camo Memorial-Day uniforms and the singing of God Bless America at the seventh-inning stretch, you’re probably a fan. And if you wish sports leagues (particularly ones with a high percentage of foreign-born players) would tone down the in-your-face Americanism… there’s always next year in Cleveland.